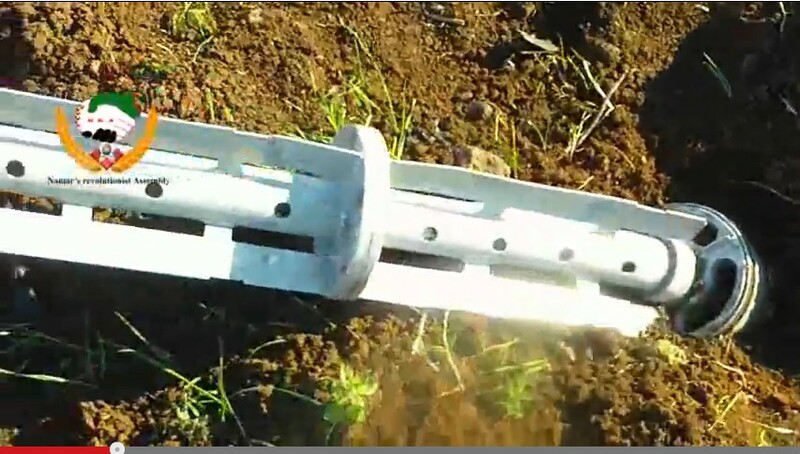 From Syria comes another video of interest, this time showing remnants of a cargo rocket which landed near Namar, in the southern governorate of Daraa. 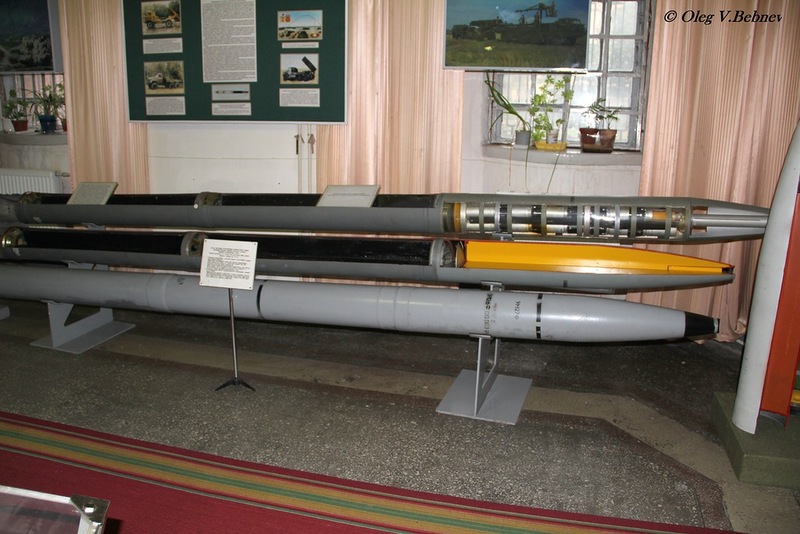 The video shows a component of the cargo section of a rocket, likely belonging to a 220 mm 9M27K series rocket (9M27K or 9M27K1, both loaded with fragmentation submunitions) as fired by the 9K57 Uragan (Ураган; ‘hurricane’) multiple-launch rocket system (MLRS). Unlike the 300 mm 9M55K cargo rocket recently documented in Syria, the remnants of these munitions come as something less of a surprise. The Syrian Arab Army is widely believed to possess the 9K57 system, however details on the range of 220 mm munitions in their arsenal are scarce. 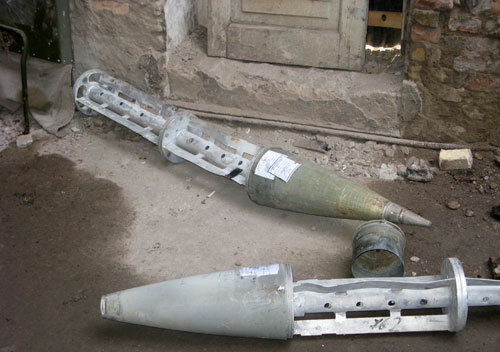 Remains of 9M27K rockets have previously been photographed in South Ossetia in 2008 during the Russia-Georgia conflict, as seen below. The component seen in Syria, part of the warhead’s cargo section, most likely reflects the use of 9M27K or 9M27K1 rockets. The technical characteristics of the 9M27K are given below. 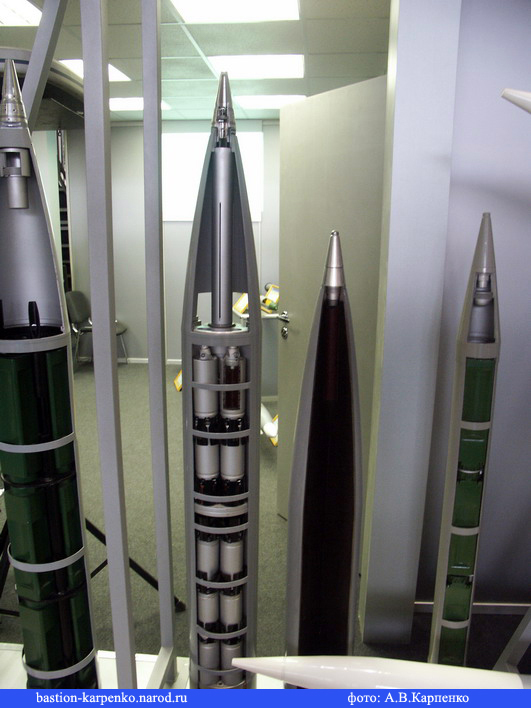 Submunitions for these weapons may well be documented in Syria in the coming days. Anyone with images or video of such, is invited to contact us. Special thanks to Eliot Higgins of Brown Moses Blog for his assistance. Technical specifications taken from the Splav State Research and Production Association FSUE’s website. Technical drawing from here; images from here, here, and here. Credits: Oleg V. Bebnev, A.V. Karpenko.